Nepal is the only surviving medieval Hindu kingdom. It consists of a high fertile valley on the southern side of the Himalayan mountains, bordered by India, China, Nepal, and Bhutan. To the north it used to be bordered by Tibet which was absorbed by the Chinese in 1950. Previously Nepal had close financial and trade links with Tibet. It was briefly invaded by Muslims in the 14th century, but apart from this short period it has remained independent. Hinduism and Buddhism are its two main religions, although in recent years there has been a growing maoist anti-government movement particularly in some of its remote areas. Nepal has been ruled by a small number of dynasties, Malla, Gorkha, Shah, and Vikrama. From the 1840's, the kings' powers were reduced after the introduction of a hereditary prime minister. This system lasted until 1950 when a popular revolution toppled the Rana family, and reinstated the king's powers. In 1959, King Mahendra declared Nepal a constitutional monarchy, and in 1962 a new system of village council (panchayat) democracy was introduced. In 2001, King Birendra and almost the entire royal family was annihilated on 1st June 2001 in an extraordinary act by Prince Dipendra, who then took his own life. King Gyanendra was crowned on June 6th 2001, the third king in a week. Nepal has issued coins for many centuries, indeed in the 16th century its coins were used in neighboring Tibet, and in the 18th century Nepal issued coins specifically for use in Tibet. 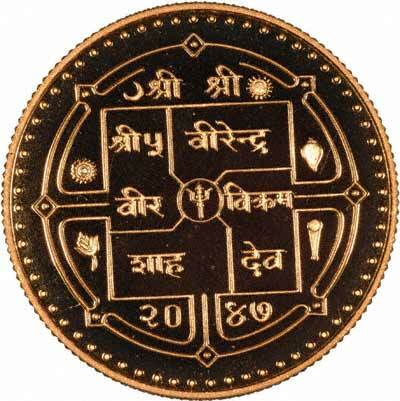 Nepalese gold coins have been issued in denominations of dam, mohar, rupee, tola, paisa, and asarfi or asarphi, together with their fractions and multiples. 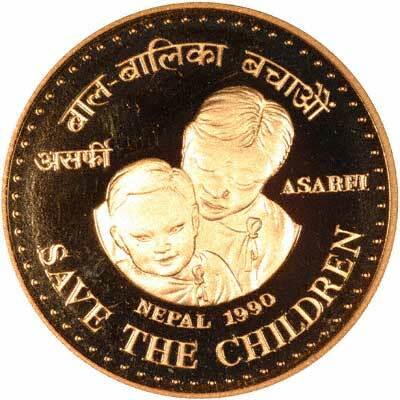 For silver and base metal coins of Nepal, please look at our original Chard Coins website.